And So I Watch You From Afar: Live @ KOKO London 23/11/17 - For Your Reading Entertainment. For some bands, certain venues will hold more emotional weight behind them than others. 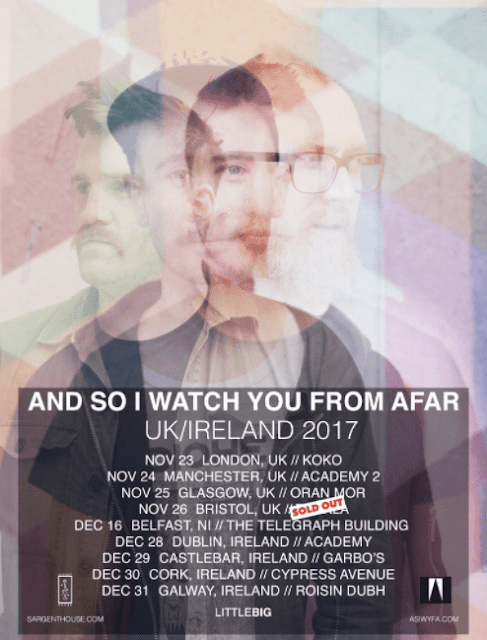 For Northern Ireland's post-metal instrumentalists And So I Watch You From Afar, playing London's KOKO is a big deal. "We used to read about KOKO in magazines growing up, so to play here tonight in front of you all, is unbelievable." It's a beautiful venue, there's no disputing that, and as the band take to the stage in front of a baying crowd already whipped into a frenzy by support act (and bloody good one at that) Gallops, it feels like we're witnessing a moment. And there are plenty of moments to witness in this set. With whirring guitars and arpeggios a plenty, it's a disorientating if not highly enjoyable affair. From the opening salvo of Search:Party:Animal to the anthemic BEAUTIFULUNIVERSEMASTERCHAMPION through to the audio assault of Wasps the crowd are dragged through soundscape after soundscape, the band stopping every so often to acknowledge how much they're enjoying the experience. With new album The Endless Shimmering released a month ago, the new songs have had time to bed in with the fanbase and it's these new cuts which make a sizeable impact with the crowd. A Slow Unfolding of Wings and Dying Giants both go down a storm. You can't beat the oldies though, with the sing along to 7 Billion People All Alive At Once, sending shivers down the spine. I'm a sucker for heavy guitars however so when Set Guitars To Kill comes around, I'm over joyed, and it's apparent I wasn't the only one. Pits, bouncing and head banging erupt and don't stop until the final chord has been rung. Where do they go from here? Well, by unleashing the best song in their arsenal the other worldly Eunoia/Big Thinks Do Remarkable. If you go away and listen to just one song from this band, I urge you for it to be that one. By the time The Voiceless comes around and ends the show, KOKO is spent and so are ASIWYFA. It's been a night to remember, and as the band trudge of stage to the cheers of those in attendance an atmosphere of triumph lingers around the venue.